Awwww... that's so cute... wait... why does the toast have a price tag? I think the real question is.. why does she have one acrylic finger nail?? and who eats something with the label still on it ? 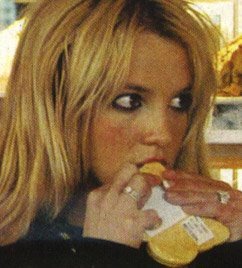 Britney can afford to starcve herself. nice finger nail! where's the other ones? She must have gotten hungry during the process and went and got some toast. lmao I LOVE HERRRR!!! Even w/ 1 nail!